The book tie-in to the feature documentary by the same title addresses population stabilization worldwide, with a special focus on the U.S., Western Europe, Ghana, Nigeria, Iran, India, Thailand, Mexico, China, and Indonesia. Population stabilization has long been considered a fundamental element of any sustainable program for humanity. Consumer habits, good and bad, are multiplied by the sheer number of consumers in poor and rich countries alike, leading to ecological despoliation. More than seventy-five key interviews from population and environmental experts around the world, along with illuminating contextual data for those interviews, forms the backdrop for the book. It is at once a compact textbook for students of the population/environment dialogue, as well as basic reading for anyone interested in the subject. No Vacancy builds upon the life-long career of Bob Gillespie, Founder and President of Population Communication. It is also a sequel to Michael Tobias's book and film World War III: Population and the Biosphere at the End of the Millennium. Whereas World War III addressed the crisis of a runaway population explosion and its all too evident impact on other species and habitat, No Vacancy focuses on techniques and policy applications that are working to reduce population numbers. It showcases those programs and regions that have achieved replacement size families, advanced the cause of safe motherhood and birth control services and counseling, as well as delivering medical and non-medical services to the patients' front doors. The feature documentary No Vacancy, hosted by family planning expert Bob Gillespie, was written and directed by Michael Tobias, produced by Tobias, Gillespie, Elizabeth Hughes, and Jane Gray Morrison, and edited by Marc and Michelle Griffith. No Vacancy profiles the policies adopted at and since the United Nations Cairo Conference, challenging a multitude of prominent global family planning leaders to address their hopes and concerns. 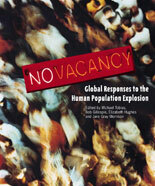 No Vacancy also asks some hard questions about the future, particularly in the realm of ecological sustainability in the Western, high-consumerist nations, while revealing astonishing achievements in many iconic regions of the world, and illuminating important comparisons between nations and population programs. Other areas of the film and book, concern women's views on their husbands' taking responsibility for health, contraception and family size decisions, and consider several initiatives that have been successful in preventing adolescent pregnancies from Ghana to Mexico. In the U.S., the picture is particularly complex and disturbing because of the nature of America's global ecological impact, but also due to the troubled politics of birth control in the United States. In the end, No Vacancy paints a picture that is exciting and upbeat, though not without its sobering ambiguities. 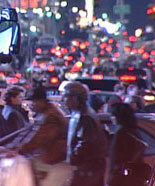 It suggests that the human capacity for working out these problems is there; that good intentions, deeply rooted convictions, and global expertise can manifest a collective will-power to turn the human population explosion around and realize a more sustainable path that should ensure a higher quality of life for the future generations that are depending on us to get it right. No Vacancy, the feature documentary, first premiered on KQED/PBS in San Francisco. It has, to date, been screened at nearly thirty festivals, fund-raisers and premieres throughout the world, and was the winner of several festivals. To order the film, click Products on the main navigation of this site. Writes one reviewer in The Futurist ("Demography –Strategies for Containing Population Growth"), "In No Vacancy, international aid advocates, and family-planning experts share their thoughts on what's working and what isn't in the fight against overpopulation"
"The International Quarterly of Community Health Education" writes, "This film which reflects on the possibility of over-population, our third global dilemma, offers a genuine reason for hope….I urge you to see this thoughtful and well-made film and thereby lift your spirits." Review Editor: Alvin E. Winder, Ph.D., M.P.H, University of Massachusetts-Amherst. To order the book and DVD: click Products on main navigation.